We’re all looking for social media content these days, right? We’d all like more “likes” and “follows” and “+1’s” and are looking for ways to get them. So… consider me impressed by how my chiropractor is getting them. Knecht Chiropractic has a raffle for a new mountain bike going on right now to increase its number of followers on Facebook and Twitter. You get one raffle ticket for showing up at your appointment on-time, three tickets for “liking” them on Facebook or Twitter, et cetera. I know, nothing revolutionary. Lots of companies do that sort of thing. Here’s the part I loved though. You get five raffle tickets for posting a video testimonial. NICE! Talk about a creative way to get yourself some testimonials. Those videos will surely be posted to the business’ social media sites, but I hope they don’t stop there. Let’s say you wanted to do something similar at your company. Here are some suggestions on how to take that raw content to the next level. allow people the freedom to post it on your social media pages, but also ask them to email you the raw video file. This will be important for the next steps. use those videos to create your own testimonial series. Chances people will talk a while about why they love your company. That’s great. I’m sure you appreciate it, but the truth is shorter is better for social media video. Since you have their raw video file, you can edit it down to a more manageable video length (30-seconds? ), add some nice graphics, maybe even a music bed. once that’s done, create a another testimonial video that incorporates a bunch of the testimonials into a single video. This video could run 1-2 minutes long. Now to do all of that well, you should probably contact a video pro and have them do it for you, but it wouldn’t be an expensive project. Regardless of what you do with the video content, it’s just a great way to get your hands on some testimonials with little effort. It’s Social Media Week here in Chicago and some of the discussion has me thinking about video ROI. I’ve been following tweets coming from the sessions, one yesterday really caught my attention. COI… cost of ignoring. WOW… love that one! The tweet was referencing something said by Erich Marx (@emarxe), Nissan’s Director of Interactive & Social Media Marketing/Public Relations. And I have to say… true for social media and true for video. It’s hard to imagine today, but 10-15 years ago web designers were out there doing their best to convince companies they all needed websites. That’s laughable now. Of course businesses need a website. I’d argue that 10-15 years from now we’ll be saying the same thing about video. Many companies have produced videos and post them at their website. They share them in email campaigns and via social media. They have a YouTube channel. At the same time, MOST businesses have not produced any videos. Less than 24% of national brands are using online marketing videos according to Kantar Media. That is going to change. The cost of ignoring video’s influence is becoming too great. A video that tells a good story is a tool that helps win hearts and minds. It’s a tool more and more marketers are seeing as an essential component to their digital campaigns. All this means many business leaders are asking the wrong question about video. They want to know the ROI when they should be asking about the COI. That’s where things are trending. One day they’re going to wake-up and realize their competitor has a well-told About Us video at their website. Another competitor will be sending email video invitations to prospects to attend company events. Another will be sharing product launch videos via social media to get customers excited about what’s coming. That’s probably the point when they’ll stop asking about video ROI and start asking about the COI, but by then the competition will have a huge head start. Content marketing is something I’ve blogged about a little bit. 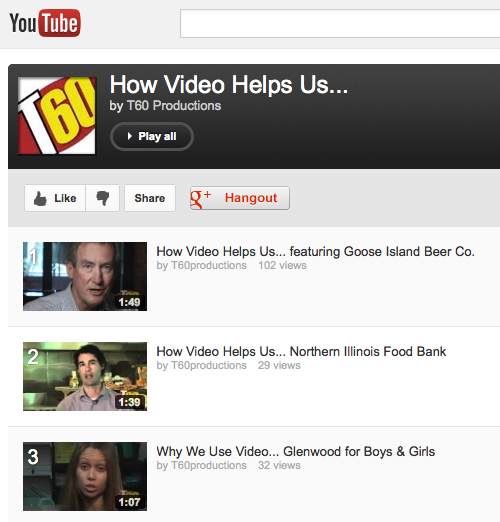 I am by no means a content marketing expert, but T60 does provide businesses with a great content marketing tool… video. And since I promote those tools, I figured I better walk the walk. That decision led to 500+ blog posts and a commitment to social media. As part of that commitment, I’ve been educating myself on the subject… consistently reading the likes of Gini Dietrich and Andy Crestodina. Both are content marketing Jedi Masters… even better… they live and work right here in Chicago. My profession has actually led me into contact with each. Gini and I have actually developed a nice working relationship. I also got a chance to meet Andy a couple times while producing videos for the ChicagoAMA. Why am I tell you this? Because when you trust smart people and follow their instruction, you tend to succeed. We recently updated the T60 website, and a big part of it was following a lot of SEO advice from both Andy and Gini. It’s all stuff I learned from their blogs and our web numbers are souring. I have also been Googling certain keywords I’d like T60 ranking in… it’s working. Yesterday, I Googled “marketing video.” Not only did one of my blog posts pop-up, but it popped-up with the Jedi Master himself. Pretty awesome. I guess my point is that there’s all sorts of great content out there these days that can help your business succeed. I hope we’re participating in that… passing along our video production expertise… but I hope you do more than just read about it. The key is putting it into practice. Okay… yesterday we celebrated our 500th blog post and promised some insight into our content marketing strategy moving forward. 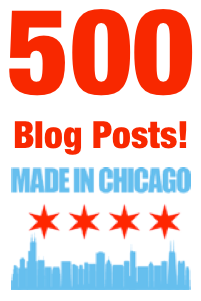 We’re happy with the blogging… I mean, 500 posts… that’s a lot of content! Thing is… we need to do better and in one specific way. Basically, it comes down to walking the walk. For the last few years, I’ve been blogging a lot about how video can help PR and marketing strategies. While we post our fair share of videos, they typically feature the work we’ve done for clients. We’re still going to do that, but we’re also going to produce more original content of our own. We dipped our toes into this last year with our video series, “How Video Helps Us.” Each one featured a T60 client talking a little bit about why and how they’re using video… their video strategy. When we produced it, we basically blocked a week and went out to shoot all three in the series. Moving forward, we’re going to talk with clients about including them in the series during the process of producing their video. I’ve never been hesitant about asking. It just always seems to slip my mind. Not anymore though, I’m going to make it a priority. Once we start producing those videos, we’ll roll them out using the blog, our social networks and probably through email campaigns. It’s a great way to show-off our clients and provide viewers with some fresh perspectives on how they can use video. Well, this is it. Blog post #500. We started blogging in October 2009. No need to do the math, it’s just under three-and-a-half years. It started slowly at first, but for the most part I’ve been blogging four days a week during most of that stretch. Yesterday, I promised some insights on what I’ve learned about content marketing during that time. Today, I’ll focus on my motivation for starting and how it has changed. Most people get into content marketing with a similar mindset. We’ll provide helpful content, over time people will get to know and trust us and that process will eventually lead to added business. Yeah… that wasn’t me. While I knew all that going in, none of that really factored into my motivation. For me, it was all about SEO. Three years ago, I looked at the T60 website and knew it needed a change. I had built it myself, and while I think it looked fine, it needed a professional’s touch and above all else it needed a lot of SEO help. Unfortunately, I didn’t have the cash to upgrade, but once I had enough to move forward I wanted to be ready. Knowing that the number of pages at a site and frequency of updates factors in to SEO, I thought I’d start writing a blog. I’ve always been a writer, so why not? Here I am 500 posts later, and the new T60 site is a week or two from going live. We’ll roll the blog into it, so I’m hoping all the hard work will pay off. What’s interesting though is the blog has provided me with so much more. One of the main reasons I wasn’t really into the typical motivation behind content media is that I honestly didn’t know how much interest there would be in my subject matter. Who the heck is going to read a daily blog on video production!? Well, the simple answer to that is at least 275 people. That’s the current number of followers we have. Not a huge number by any means, but it’s more than I thought we’d have. We don’t get a ton of comments, but we do get a fair share of “likes” everyday. That’s a nice feeling, but it’s only part of our new motivation. Now… it’s about ‘cred. Being a consistent blogger has given me/T60 added credibility, and it’s starting to pay-off. I know that’s a big reason why a lot of people get into content marketing, but it has slowly grown on me and I’m here to say it works… only I’ve found it in a different way. I don’t know how much online ‘cred I have, but T60’s clients always seem impressed by the blog. Over the 500 posts, I’ve blogged about a lot of FAQs we get from prospects, so one of the things we now do is occasionally work the blog into our proposals. For example, if a prospect asks me a question about storytelling, I follow it up with a proposal that includes links to blog posts on that subject… and they eat it up! Not only do they appreciate the actual information, they’re impressed by my commitment to blogging. Anyway, I’m here to tell you… content marketing works. It isn’t a quick strategy. I’m three-and-a-half years in and it’s just now starting to pay-off, but I’m glad I got into it. 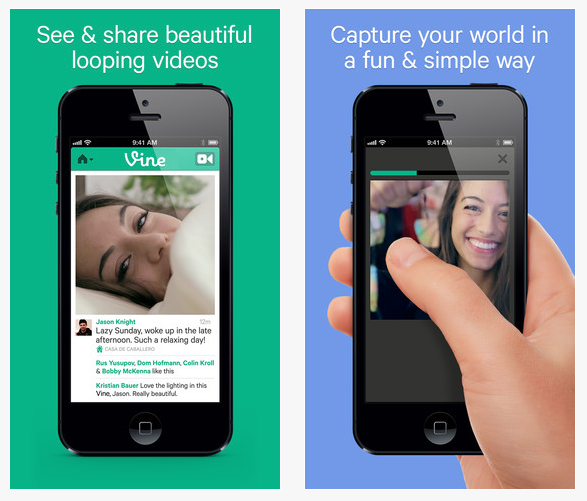 Okay… what do you think of Vine? Not up on the new social video platform? Well, you can read more about it at Twitter’s blog. Basically, it’s a new Twitter app that allows people to capture and share 6-second videos. What can you share in 6-seconds? I think that’s the idea. Like the 140 character limit, they’re looking for some creativity from users. I have no idea how businesses will start to use the service, but if it catches on I’m sure business leaders will be working overtime to capitalize. I take that back, they’ll have their creative teams working overtime. 6-second storytelling… I’m choosing not to be irked and to simply look at this as a challenge. I went to log on to Facebook over the Thanksgiving holiday and received a welcome surprise. Facebook has long featured a video on its login screen, but it’s usually some sort of motion graphics video demonstrating Facebook features. This time, however, it was some quality storytelling. 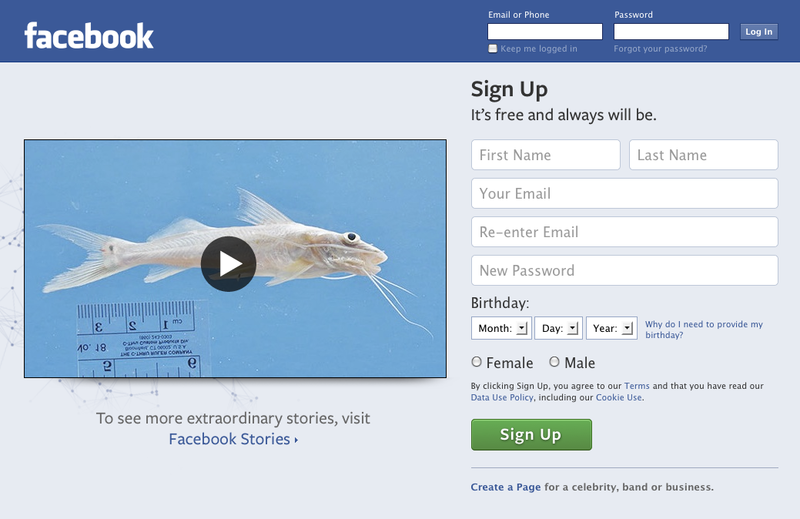 The social media giant has produced a segment called, Facebook Stories. It’s a series of videos highlighting some of the uses for Facebook. I loved the first one I saw about a fish scientist (video: Speeding Up Science). The first half is all about what this guy does for a living, and then they hit you with the innovative way he’s using Facebook. This is something everyone can learn from. Find the people who are using your products or services, tell their stories, then how you’re helping them. It’s “selling” without sounding like you’re selling. That’s the power of video and storytelling. Anyone out there a fan of Pockets? It’s a Chicagoland sandwich chain and it’s one of my favorites. I follow them on Facebook and noticed a video they posted yesterday. It promotes that the chain is now making pizzas and provides a promo code for $5 off an online order. Okay, there’s nothing earth-shattering here. The video really isn’t anything interesting, but here’s what’s important… I watched. How many Pockets Facebook posts do you think I’ve blown through and not even noticed? I’m sure a ton, but I stopped when I saw video. Not because I was Facebook-mining for blog material (yup, I occasionally do that). 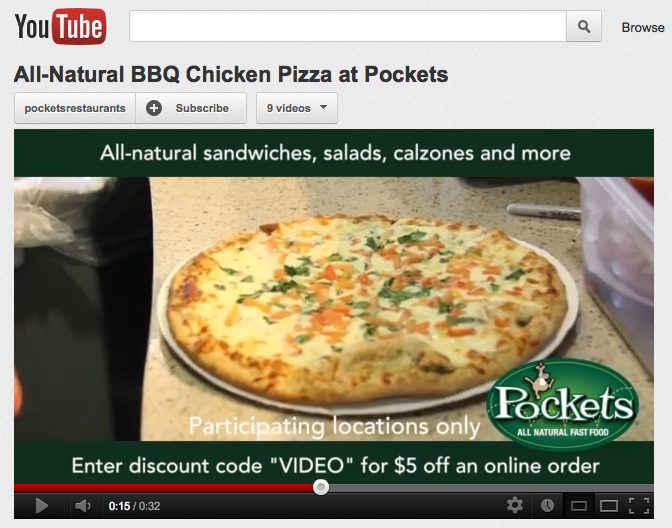 No, it was because the video icon caught my eye and I was curious to learn more about their pizzas. Video does a good job if catching our attention. It’s just one of the many reasons why it’s a great way to promote your business or brand. This post is for anyone who’s hosting an event. PR pros, event coordinators or the company employee who’s been given the task of organizing an important party, launch or meeting. You booked the venue, worked out catering, created the invites… did you remember a videographer? Sure, a photographer might be on your to-do list, but a videographer brings even greater social value. I’m not talking about shooting some general video, slapping it together and sending it out. I’m talking about creative video, interviews and quality storytelling that gives viewers a sense of what it was like to be at the event. We haven’t even gotten to social media yet. You can share the video there as well. 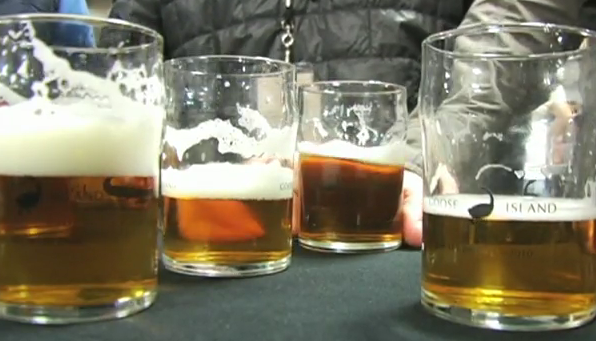 Did I mention you can use the video to promote the same or similar event the next year? You spend lots of time, energy and cash on these events, and they’re usually over in a matter of hours. Why not produce a video that allows the it to live on well after the party ends? 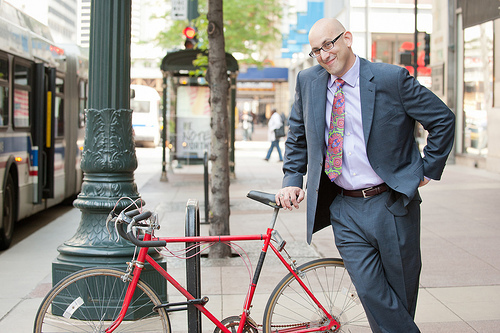 I got to meet marketing expert Geoff Livingston during a shoot a couple of months ago. He and one of our clients, Arment Dietrich CEO Gini Dietrich, were launching a new book. Geoff’s a fun guy. I’ve been reading his blog ever since, and yesterday’s post really got my attention. The title says it all… Customers Don’t Care About Us. He writes about how social engagement doesn’t always add up to more sales… that recommendations by peers rule. That’s one of the reasons I frequently encourage clients to make their videos about their customers… not them. I’m talking about going beyond the testimonial. The heart of the story is about your client’s business, then eventually work in how your company helps them. You can also use them in projects or with issues you’re passionate about. In our case, we have an ongoing video series about why our clients use video. Each is a powerful way to show a) how dedicated you are to your clients… giving them some free publicity. And b) how dedicated they are to you… that they’re willing to go on camera for your company. That’s a message prospects will trust.